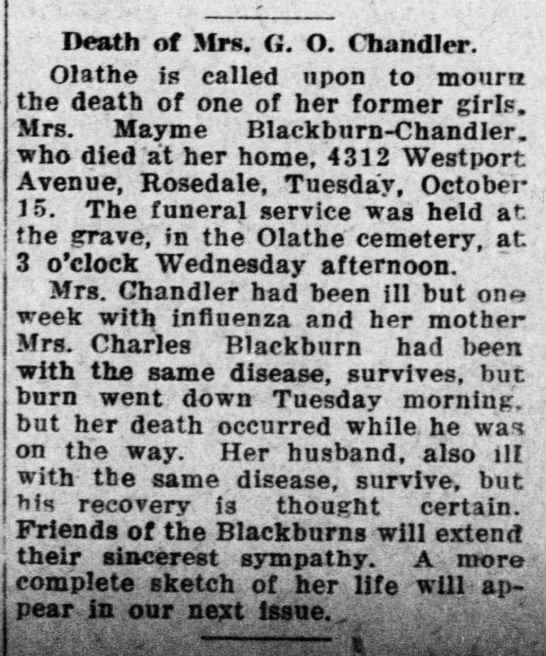 Death of Mrs. G. O. Chandler. Olathe is called upon to mourn the death of one of her former girls. Mrs. Mayme Blackburn-Chandler, Blackburn-Chandler, who died at her home, 4312 Westport Avenue, Rosedale, Tuesday, October 15. The funeral service was held at the grave, in the Olathe cemetery, at 3 o''clock Wednesday afternoon. 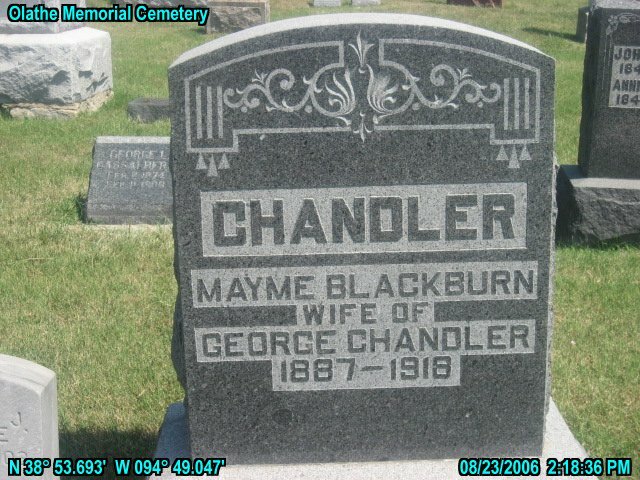 Mrs. Chandler had been ill but one week with influenza and her mother Mrs. Charles Blackburn had been with the same disease, survives, but burn went down Tuesday morning, but her death occurred while he wa on the way. Her husband, also ill with the same disease, survive, but his recovery is thought certain. Friends of the Blackburns will extend their sincerest sympathy. A more complete sketch of her life will appear appear in our next issue. Please share your memories of Mayme Blackburn.